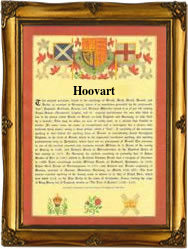 Recorded as Harvard, Hovard (English and Scottish) and Hovart and Hoovart (Dutch), this interesting name derives from an Olde English pre 7th century personal name. This was 'Hereweard', a compound of the elements "Heri", meaning an army, plus "weard", guard or defence. The name is recorded as Hereuuard and Heruart in the famous Domesday Book of 1086 and it was borne by an 11th Century thane of Lincolnshire known to history as Hereward, the Wake. He defied William the Conqueror, for several years upto 1070, and was never captured alive. The surname is first recorded in the mid 12th Century, (see below). It is particularly well recorded in the surviving church registers of the diocese of Greater London from Elizabethan times, under spellings such as Harrvard, Haruard, Hoavert as examples. The name is particularly famous in the United States of America, with John Harvard (1607 - 1638) the founder of Harvard University. He was born in Southwark, London. Other examples include on October 4th 1546 Cylmyne Haverd and John Carter who were married at St. Margaret's Westminster, whilst a John Harvrd married Ely Wheler in the same church on July 1st 1564. The first recorded spelling of the family name is shown to be that of Alexander Hereward. This was dated 1156, in the records of the abbey of Bury St. Edmunds, Suffolk, during the reign of King Henry 11nd of England, 1154 - 1189. Throughout the centuries, surnames in every country have continued to "develop" often leading to astonishing variants of the original spelling.